Synthetic fibers have different shapes that influence their characteristics and performance. Monofilaments are endless thick fibers with a stiff structure that offer very good abrasion resistance and low dirt take-up. Multifilaments are a bundle of thin fibers which are processed into twines before braiding a rope out of them. Most fibers follow this design which leads to high flexibility and tensile strength. Textured fibers are based on natural fibers and show a certain degree of disorder which gives the fibers good grip and high elasticity. The last type of fibers are Staple fibers which consist of spun pieces of short filaments. This construction gives the fiber excellent grip and soft handling. Multifilaments are a bundle of thin fibers which are processed into twines before braiding a rope out of them. Most fibers follow this design which leads to high flexibility and tensile strength. Textured fibers are based on natural fibers and show a certain degree of disorder which gives the fibers good grip and high elasticity. Staple fibers consist of spun pieces of short filaments. This construction gives the fiber excellent grip and soft handling. Polyamide or better known under its trade name Nylon, has high breaking load as well as high elongation. Preferably, it is used in products that are required to absorb shock loads like dynamic climbing ropes. The abrasion resistance of nylon is better in wet conditions than in dry conditions because it tends to take up water (up to 7%). Kept in wet conditions for too long, the material can become stiff. Another disadvantage compared to polyester is the lower resistance to UV-radiation in sunlight. Polyester is mainly used for static ropes because Polyester is characterized by good breaking loads and low stretch. This material offers both chemical and physical advantages such as UV resistance salt water resistance, and good abrasion strength in both dry and wet conditions. However, the dynamic energy absorption capacity is much lower than that of nylon ropes and therefore only to a limited extent suitable for types of use involving high impact forces. UHMWPE (also known as UHMPE or HMPE Dyneema®) is an extremely high strength fiber of ultra high molecular polyethylene. For the same weight it has 15 times the tensile strength of steel. Rope or slings made from this type of fiber shows very low elongation and tensile strength. If very high loads are being applied for a long period of time, UHMWPE fiber tends to creep. The rope then is irreversibly extending its length. At the same time, these robust fibers show excellent performance in terms of abrasion resistance and good UV-resistance. 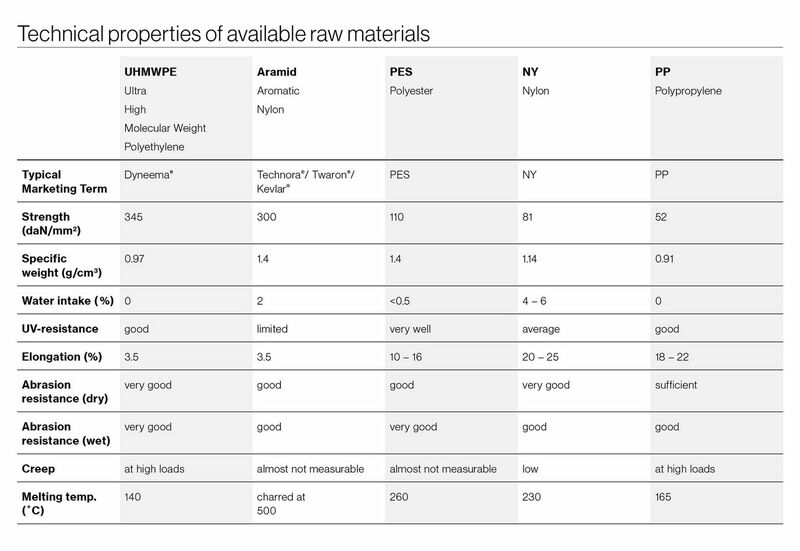 Aramid fibers have an extremely high breaking load and show almost no stretch. On the other hand they are sensitive to UV-rays, bending over sharp edges, and abrasion. It is mainly used in places where high temperature resistance and abrasion is essential, for example on winches, in hot air balloon ropes or for canyoneering where the rope is nearly always in contact with rough stones. Due to its limited technical characteristics, polypropylene is only used for simple applications. PP is very light and even buoyant in water, that’s why it is used for water throwlines. Its abrasion resistance and temperature resistance are lower than those of most other fibers.